(CNN) -- Here is a look at the resume and record of federal Judge Sonia Sotomayor, whom President Barack Obama has chosen as his nominee for the U.S. Supreme Court. 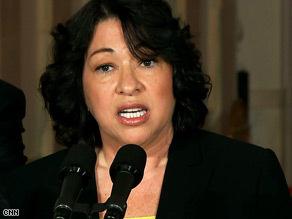 Judge Sonia Sotomayor is President Obama's pick to replace Justice David Souter on the U.S. Supreme Court. • Wrote the 2008 opinion supporting the City of New Haven's decision to throw out the results of a firefighter promotion exam because almost no minorities qualified for promotions. The Supreme Court heard the case in April 2009 and a final opinion is pending. • Sided with environmentalists in a 2007 case that would have allowed the EPA to consider the cost-effectiveness of protecting fish and aquatic life in rivers and lakes located near power plants. Was overturned by the Supreme Court. • Supported the right to sue national investment firms in state court, rather than in federal court. Was overturned unanimously by the Supreme Court. • Ruled that a federal law allowing lawsuits against individual federal government officers and agents for constitutional rights violations also extends to private corporations working on behalf of the federal government. Was overturned by the Supreme Court. • Sotomayor was first appointed to the federal bench in 1991 by a Republican President, George Bush, but it was a Democrat, Sen. Patrick Moynihan, who recommended her to Bush.